This part is colourful because it deals with LEDs. LEDs are seen everywhere from indicators to room lighting. It is popularizing due to its long life and low current consumption. Power loss through heat generation is practically nil in LED. It operates in low voltage and low current and is the inevitable part of an electronic gadget. LED is a simple diode with a PN junction doped with special materials to emit particular colours. When a potential is applied to its PN junction, it emits Photons in the form of colourful light. 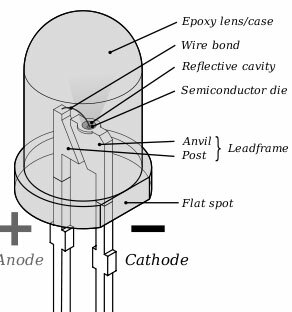 Inside the casing of an LED, there are two terminal posts connected by a small chip made of Gallium compound. This material exhibits the property of photon emission when the p-n junction is forward biased. Different colours are produced by doping the base material with other substances. LED has two pins. The long one is Anode ( Positive) and short one is Cathode ( Negative). But in some types, these leads are arranged in reverse.In some types, both the leads have same length. In such cases, test before soldering. The pin near the flat cutting of the LED case is Cathode. Keep a 3 Volt Lithium Cell in the work bench to test LED safely. It very easy to make contact with the lithium cell. Colour output depends on the material doped in the base material. Following are the materials used in LEDs. 8. Ultraviolet LED – Indium gallium nitride, Aluminium gallium nitride. An LED that can give different colours is useful in some applications. For example, an LED could indicate all systems OK when it becomes Green and faulty if it becomes Red. LEDs that can produce two colours are called Bicolour LEDs. A bicolour LED encloses two LEDs (usually Red and Green) in a common package. The two chips are mounted on two terminal posts so that the anode of one LED forms the cathode of the other. Bicolour LED gives Red colour if current passes in one direction and turns Green when the direction of current is reversed. Tricolour and Multicolour LEDs are also available which have two or more chips enclosed in a common package. The Tricolour LED has two anodes for red and green chips and a common cathode. So it emits red and green colours depending on the anode that carries current. 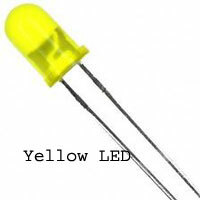 If both the anodes are connected to positive, both the LEDs lights and yellow colour is produced. Common anode and separate cathode type LEDs are also available. Bicolour LED glows in different colours ranging from green through yellow orange and red based on the current flowing through their anodes by selecting suitable series resistor to restrict anode current. Multicolor LED contains more than two chips-usually red, green and blue chips- within a single package. Flashing type multicolor LEDs are now available with two leads. This gives a rainbow colour display. It is like the ordinary LED but emits invisible Infrared rays. Human eye is insensitive to Infrared, but the LED is emitting IR like the light from other LEDs. 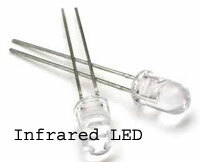 IR LED is used in Remotes, Burglar alarms etc. This kind of LED flashes when connected to the power. It may have two leads like the ordinary LEDs but some types have three terminals- One steady Anode, one flashing anode and a common cathode. So the LED can be used for dual purpose to indicate steady condition as well as a warning indicator. Forward current ( If ) is the current flowing through the LED when it is forward biased and it should be restricted to 10 to 30 milli amperes otherwise LED will be destroyed. Forward voltage (Vf) is the voltage drop across the LED when it conducts. 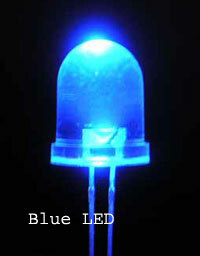 The forward voltage drop range from 1.8 V to 2.6 Volts in ordinary LEDs but in Blue and White it will go up to 5 volts. Wattage of the LED is the forward voltage multiplied by the forward current. In high current LEDs, forward current can go up to 350 mA. In these devices the wattage depends on the forward voltage drop ranging from 1.8 volts to 4 volts. Therefore an average of 1 watt is found in high current LEDs. LED requires a Ballast resistor. LED requires a current limiting resistor to limit its current between 10 milli ampere to 30 milli ampere. An ordinary LED becomes FED (Fume emitting diode) if the current increases above 30 milli ampere. The resistor is called as” Ballast resistor” which protects LED from damage due to excess current. It regulates the forward current to the LED to a safer limit and protects it from burning. Value of the resistor determines the forward current and hence the brightness of LED. Where VS is the supply voltage, Vd is the forward voltage drop of LED and I, the required current through the LED. As a rule 20 mA is an ideal current. 12 – 1.8 / 0.02 A = 510 Ohms. Since 510 Ohms resistor is not common, use 470 Ohms or 560 Ohms. But without any calculation, use 1K resistor for 9-12 volts and 470 Ohms for 5-9 volts. 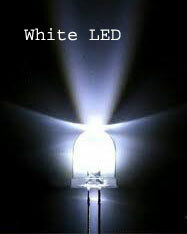 If less current is used, life of LED can be extended even though there will be slight reduction in the brightness. In indicators, it is not a problem.